Elijah Akins enlisted in Capt. McAllister's Hardwick Mtd. Rifles on September 23, 1863 in Bryan County, Ga. and when the unit split to make 2 companies, he went to Co. B. Then on February 13, 1864 was transferred to Co. H, 7th Regiment, Georgia Cavalry when it was formed. 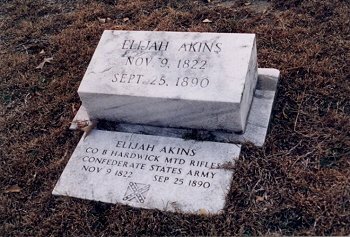 Elijah died September 25, 1890 and is buried at Upper Black Creek Primitive Baptist Church Cemetery in Bulloch County, Ga.